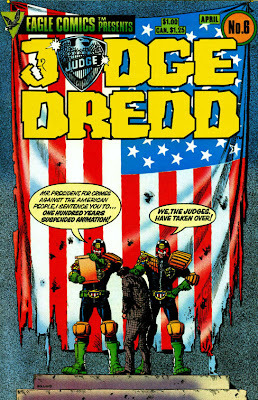 This week, we've gotten to one of the biggest Judge Dredd stories, so we've got two special guests to discuss it with! Sara Ryan is the author of two award-winning young adult novels, Empress of the World and The Rules for Hearts, and has written some terrific minicomics; Dark Horse will be publishing her and Carla Speed McNeil's graphic novel Bad Houses. Gordon Dahlquist is the author of the Victorian fantasy thrillers The Glass Books of the Dream, The Dark Volume and The Chemickal Marriage, as well as a whole lot of plays. I was delighted to talk to both of them about Origins. 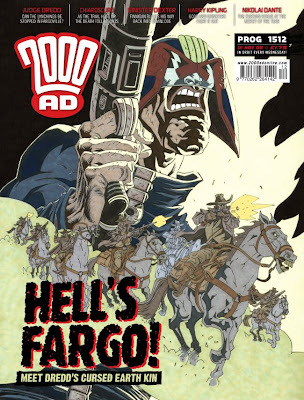 It's not entirely clarifying on the subject of Fargo's early life and career; Dredd points out that the expository movie he sees in Fargoville is partly falsified. (That may have a bit to do with the messy and slightly contradictory information about Fargo that had turned up earlier in the series, when John Wagner and company were more or less winging it; Origins doesn't even touch on the Arden Polders business from "The Cal Files.") 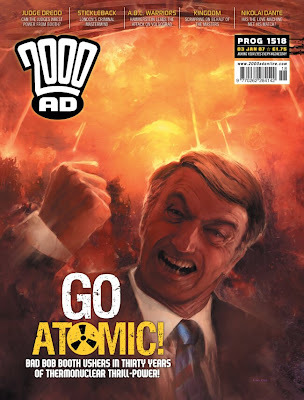 It also elides over most of the Pat Mills universe's putative connection to the Dreddverse; if the chaos of the 21st century started with a Volgan invasion of Britain in 1999, Wagner doesn't touch on it here (but also doesn't contradict it). What Origins is the origin of is mostly how Dredd's world got to be as horribly messed up as it is. 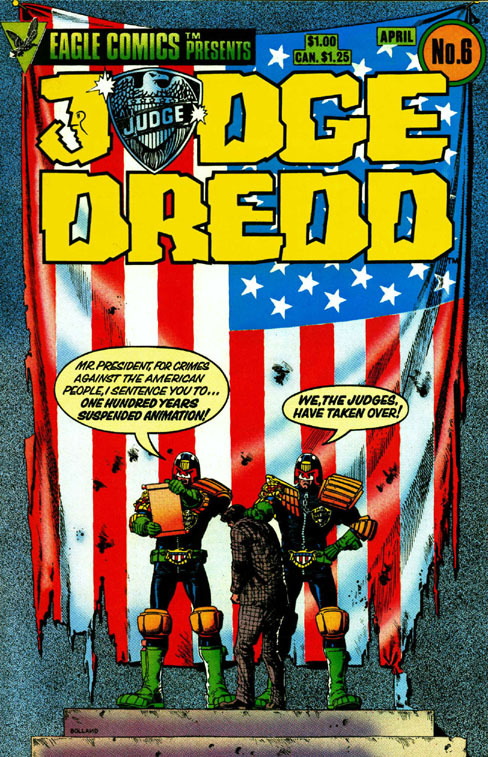 It's been pointed out more than a few times that the real subject of the series isn't Dredd himself--that he's basically the catalyst for stories about Mega-City One, and about the Judge system. Wagner had also been hinting for many years that there was a "big lie": that the Judges' power was fundamentally illegitimate, or that they weren't worthy of it. Fargo's inability to abide by his own rules is part of his "original sin," although arguably the greater error is that he isn't able to forgive himself for it, putting his honor above the greater public good. The payoff of this story is its next-to-last scene, in which the dying Fargo (who's not only effectively Dredd's father but his other self) disavows the system he created--the world-view that's the only one Dredd has ever known ("It was never meant to be forever, Joe!") --and Dredd lies about it to cover it up in the very next scene. The amount of backstory here means that Origins is also heavily weighted toward info-dump, which is unusual for a series whose hallmark is usually worldbuilding-in-passing. There's a bit of present-day plot near the beginning (and I kind of think the biggest misstep in the story is that it instantly gets sidetracked into the subplot with the mutants), and then chapter after chapter of rattled-off history until it finally gets to the big fight scene at Booth's compound. So my first question for the two of you is a broad one: What's an origin for? Why do we, as serial readers, always want to know about a character's (or setting's) beginnings? How much is it possible to imply about a science-fictional world before you have to sit down and spell out its internal workings? 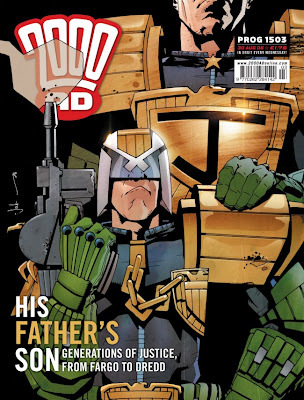 What do you think Dredd gained or lost by deferring this story for thirty years, and by finally telling it--and what does this one tell you, or suggest to you, as readers who are getting your first exposure to the series at this point? SARA: I think an origin story is a kind of reverse fortune-telling. It's just as compelling as the standard variety, but instead of asking what's going to happen, you're finding out what happened then that made things the way they are now. And particularly in a speculative fiction context, with an origin story you're working your way back to the "what if?" questions that the creators asked themselves to generate the setting and characters; in this case, what if a combination of social unrest and political corruption gave rise to the professionalization of vigilante-style justice as a means of keeping order? And Douglas -- even though you explain that it isn't actually Dredd's origin and I believe you -- as a new reader, that is how I read it; the macrocosm origin of the world-as-it-is-now juxtaposed with the microcosm of Dredd's place in it. "How much is it possible to imply about a science-fictional world before you have to sit down and spell out its internal workings?" I think you don't ever have to spell them out; it's often the case that a reader can fill in the gaps more compellingly than the writer(s). And yet there's also a readerly appetite for consistent, resonant worldbuilding, especially when, in the words of the immortal Lester Freamon of The Wire, "all the pieces matter." GORDON: Well, it seems like one reason to keep world-origins fuzzy in science-fiction is the same as to make your character embody a few big ideas - justice, violence, law, order - without necessarily cluttering that up with a bunch of sidebar stuff, like 'emotional complexity'. I don't mean that negatively, and I don't mean JD can't be emotionally complex - just that this structure allows the complexity to rest more in the realm of ideas than in personal dynamics, and that seems a pretty classic way of structuring things in sci-fi. Which is maybe only to say, that when you have characters who are even broadly emblematic, then whatever they're doing carries an automatic interplay between those embedded ideas and an immediate story line, and their creators have an enormous and ongoing flexibility about what they can address, since the given circumstances aren't so much bound by fact as theme. Which is really a long way round to say that my first response to Origins was to wonder "Why now, after all this time, when things were going so well? Weren't they?" My sense is that Origins doesn't speak so much to Dredd's actual conception - that is, material they didn't have time to address or include at the time - as much as how our world might have changed in the meantime. I can't read the subplot about Booth exploiting computerized voting to steal an election without thinking of Diebold's disputed role in various elections, especially Ohio in 2004. Booth's plotting feels well in the range of standard, internalized 2006 paranoia - and however extreme the consequences for the world, those sections of Origins strike me as weirdly prosaic. Similarly, while we hadn't seen the Tea Party by 2006, certainly the worst of post-9/11 nationalism can be seen to inform Booth's ideologies. So one question I have about Dredd's origin is whether it comes when the necessarily paranoid machinations have become more credible? My other question was about the info-dumping. I found "The Connection" to be a pretty crisp trail of mayhem with a genuine mystery at its center, and while "Origins" definitely follows up that mystery, it's nowhere near as crisp in its story-telling - again, so deliberate is this that I don't even mean it as a criticism, just an observation. Sara's point about mashups struck me as well. "Origins" repeatedly swerves between the quest for Fargo itself and a handful of extreme side-trips - and hook is a good way to describe the way each manages to seem relevant as much because we recognize it as because what happens naturally follows. But of course, I don't know if the short-hand here - mutants! Mad Max! Westerns! - is itself old news to anyone who's actually up on past excursions through the Cursed Earth. Or is it that narrative structure gets mutated there as much as anything else? DOUGLAS: Dredd is fundamentally unknowable in some ways; he's the embodiment of justice without goodness, of a person subsumed by the law. 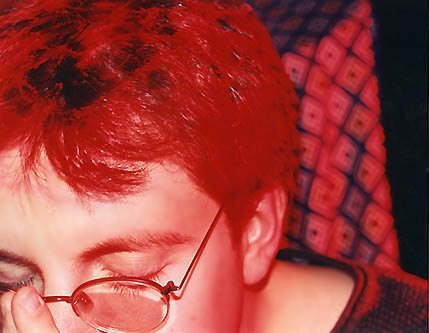 The most obvious symbol of that, famously, is that we never see his full face. (Which leads to some visual side-stepping in "Origins": since Dredd's a clone of Fargo, he would of course look like him, so we never get to see Fargo's face either! He's always wearing his riot gear, or a football helmet, or in too long a shot to make out his features, and so on.) Still, you can't publish 2100-plus episodes about a character without at least hinting at some kind of interiority; the compromise with Dredd is that he denies having emotional complexity, even to himself. You're right about the relative narrative murkiness of "Origins," Gordon. The best long Dredd stories have some kind of very solid structure--the constant escalation of "The Apocalypse War," the focal shifts of "Necropolis," the gradual convergence of "Trifecta," the domino-setup/knockdown of "Day of Chaos." But the climax of "Origins"' action, the showdown with Booth's people, doesn't have a lot to do with the information it's been throwing at us; the emotional climax is Fargo's deathbed confession, which still doesn't quite hold together everything that's come before it. As for the "why now": it might have been that a lot of the best Dredd stories in the five years or so leading up to "Origins" had circled around the Fargo bloodline, or had directly addressed the force of history. ("Cadet," one of the most effective Wagner stories to make use of many years having passed since an earlier sequence, ran in the Megazine at the same time as "Origins"!) Or it might have been that there had been so many stories addressing the backstory piecemeal that it had to get codified before it got impossibly tangled. No idea. GORDON: I also appreciated the humor that runs throughout, both the this-is-how-it-works-here gags like Dredd being flogged and doing back-breaking manual labor still wearing his riot helmet, and the guignol slapstick like the unlucky leaders of Fargoville who've tried to use the Judges' weapons and stand gobsmacked looking at their bloody stumps (cue sad yokel trombone). But the cynicism behind the entire Origins narrative demonstrates another, darker vein of humor, a blasted irony where even the honest efforts of the various hard-working judges are seen to be in service of a routinely corrupted and misunderstood ideal. It's this darkness that I've always associated with Dredd, despite not having read it - and frankly, what surprises me most in Origins is how the narrative takes pains to portray the Judges struggling to to keep Fargo's legacy - Solomon, Goodman, etc. - in such a positive light. While I assumed that the martial-law violence of Dredd came from a fundamental pessimism about the human character - that, on some level, or in many circumstances, Dredd's actions made sense - there's also a lot of old Roman virtue on display as well. Despite that end-note of Fargo repudiating his work, the villain of the piece - and the destroyer of worlds - is clearly Booth, and only for the Judges was anything saved at all. So even in that last moment - which I agree, is the emotional climax - I'm unsure what impact his revelation is supposed to have, since in Origins, at least, the Judges seem the best of a battered world. Or is it that no one looks back upon their origins without feeling regret? One more thing, too, about the "why now" - or maybe I just can't let go of the topicality. But as an American, I can't read Fargo's last words that "it wasn't supposed to be forever" and not think about the Bush/Cheney national security state, something that's only become more deeply entrenched under Obama. While the nuclear scenarios in Origins that lead to the Cursed Earth and the other destroyed Mega-Cities may seem like a sci-fi cliche we (fingers crossed) have moved past, almost everything else seems perfectly credible as an outgrowth of our present, even up to the environmental destruction. DOUGLAS: I agree that it's pretty fascinating that Origins' fascists generally aren't shown as being evil or megalomaniacal; they genuinely believe they're doing what's best. Booth, on the other hand, is nakedly an American exceptionalist--remember, this is a series by and (mostly) for British people: "Foreign states have been every opportunity to come to a reasonable settlement over their reserves. Foolishly, they insist on holding our country to ransom." Ouch! One of my favorite tricks in this series, though, and one that's come up here a few times, is that it's constantly switching where its readers' sympathies lie. Mega-City One is, absolutely, a national security state: a "war on crime" with exactly as much of its concluding conditions defined as our world's "war on terrorism." (Maybe Fargo's real error was not figuring out how the Judges' reign could end.) The bitter twist is that it has in no way made its citizens safer, and a lot of the worst things that have happened to the city, including Chaos Day and what Hershey refers to in #1812 as "the Titan rebellion" (I see what she did there), are directly or indirectly the Judges' fault--they're consequences of the Judges' actions, at least. Let's talk a little about the visual side of Origins--"The Connection," drawn by Kev Walker (who had previously drawn a couple of mood-intensive Dredd stories in 2002 and 2005) and "Origins" itself, drawn by Carlos Ezquerra, Dredd's co-creator. Before I say anything more, though, I'm curious about your thoughts. SARA: I'm not sure I have much of interest to say about the art. I was struck by the frequency of panels featuring giant heads (which strategy, I am informed, is technically known as Large Vignetted Inset Closeups), and also of figures breaking panel borders. I loved the way the mutants were drawn, and felt like there was something Northern-Renaissance-grotesque about the approach; the hat-wearing wood-carrier in the beginning of "Legacy" would be right at home in a Bosch or Brueghel painting. And paging through the issues quickly again, I note a lot of purple tones throughout, which made me think of the book that analyzes the symbolism of color palettes in film, If It's Purple, Someone's Gonna Die: The Power of Color In Visual Storytelling -- implying, perhaps, that someone's always gonna die in the world of Dredd. GORDON: Douglas, I have to say that my first reaction is to prefer Kev Walker's art for "The Connection." The clean lines and sparse compositions - mainly setting simply drawn figures against an all-but-monochrome field - foreground the noirish procedural plot pretty effectively, and deftly throw the focus onto Dredd's internal process. In contrast, Ezquerra's art strikes me as oddly crude, a weird mix of too much detail and broad, coarse characterization. And yet, I can't deny that this coarseness fits the black humor and the ultraviolence. I might not like it per se, but no doubt it carries a charge. 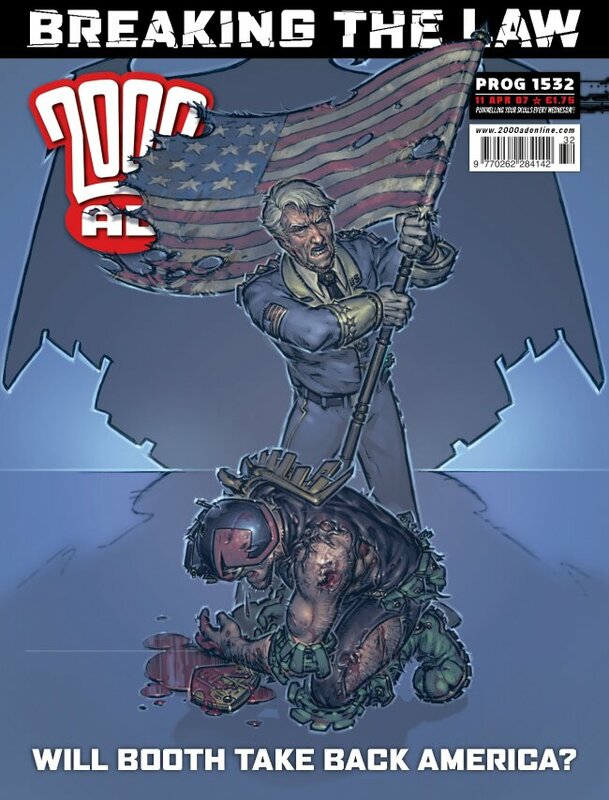 How much of this is about Dredd being a non-American comic, I wonder? There's a slickness to "The Connection" - it reminds me of the few Hellboy comics I've read - that seems very consistent with American comics. But Ezquerra's art seems really non-American to me, or at the least quite out of the mainstream. 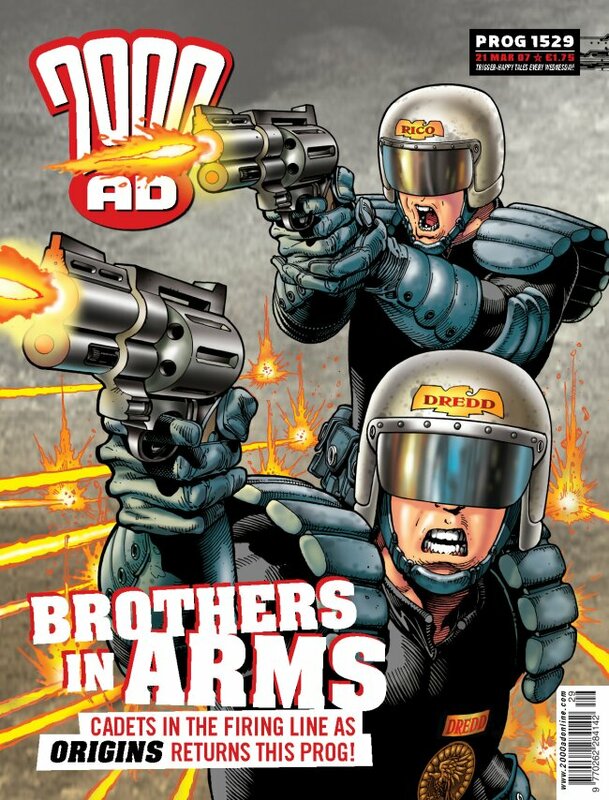 I'd be curious what your take on the art is, and how Ezquerra's art works in dialogue with the other visual takes on Dredd's world. It's interesting to me that, if his is the mainstay art, or the template, that the comic would stray so far in different directions. DOUGLAS: One of the ways that Dredd's unusual in British and European comics is that there isn't necessarily a single "definitive" artist associated with the look of the series--or, rather, there are lots of different ideas about who the definitive artist would be. Americans often tend to think that it's Brian Bolland, who drew most of the phenomenal early covers for the 1983 Eagle Comics reprint series--the first exposure a lot of Americans had to the character. 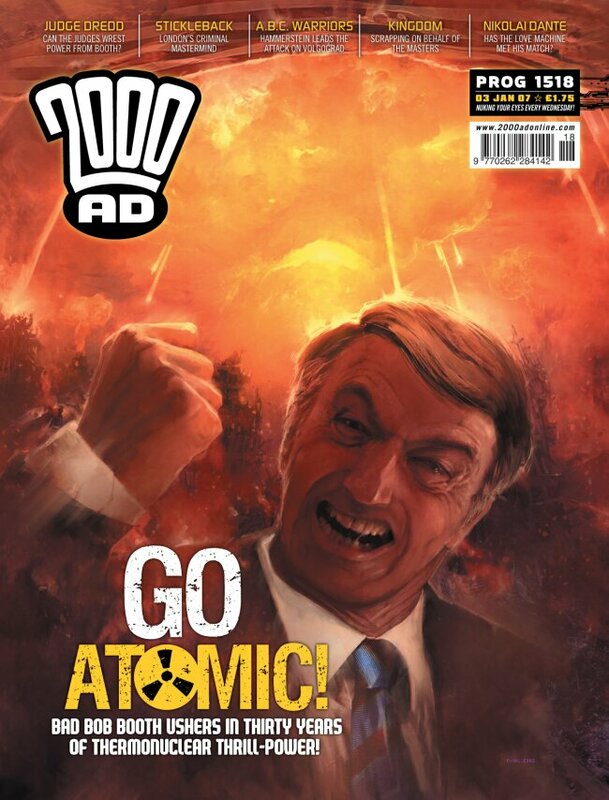 (The one that appears above was for a reprint of the part of "The Cursed Earth" that introduced President Booth.) 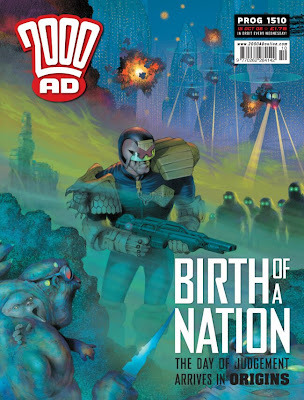 The image on the cover of Origins is, I believe, the final 2000 AD cover Bolland's drawn to date. But I've also talked to people who think the definitive Dredd artist is Ezquerra (his work is always at least interesting, and when he's on, it's on), or Ron Smith (who drew the weekly newspaper strip for its early years). Ben Saunders waved the flag for Mike McMahon, whose work I totally didn't get when I first encountered it thirty years ago, and now love. Al Ewing named Henry Flint in an interview last week, and it's hard to argue with that, given the way Flint's been knocking it out of the park lately. You could make a solid case for Cliff Robinson, who drew the image of the cadets below. And so on. Ezquerra's an interesting case, though, because his stuff is so idiomatically unlike American mainstream comics. (And that's a good point, Gordon, about how Hellboy-ish Walker's art on "The Connection" looks, although I think some of that may be that his color sense shares something with Hellboy colorist Dave Stewart's.) Ezquerra's a European artist through-and-through--a European pulp artist, really, with his background in Westerns and war stories. (I can't think of any other American artist who does the sort of thick, scalloped lines that he tends to use for the contours of Dredd's helmet.) He's drawn a few American comics, virtually always working with Garth Ennis or Wagner or Grant... and it's true that his work is really coarse-looking at times, but that grit is a lot of the fun of it for me. In a lot of ways, his work reminds me of Steve Ditko's; neither of them can get very near "pretty," but they do "grotesque," both people and spaces, really well, and they're incredibly good at communicating complicated action visually. We don't get a lot of that here--the action of "Origins" is sparse and mostly straightforward--but we get a few tastes of it, like the escape from the hospital. That's the Ezquerra I love as much as the one who draws Brueghelesque mutants. Fargo's line about how it was never meant to be forever sends a shiver up my spine everytime I read it. It completely knocks Dredd's core beliefs sideways. No longer is he the living purified embodiment of Fargo's "divine" mission to bring justice to all - no matter the cost. I trust that John Wagner is playing a really long game and now a smaller Mega City 1 will be reconstituted as a democracy with Rico, Beeny, Dolman et al as it's new guardians working inside a reformed Justice Department. That's a great summation of the appeal of Ezquerra's work. I can see why the many pushes to launch the character in the US have lead with the beautiful Bolland strips, since so many of the best artists to work on the character (McMahon, Ezquerra, McCarthy) have a spikiness and grit to their work that's probably more in sympathy with the character and the stories, but which might be off-putting to new readers. My first encounter with Ezquerra's work was on the Strontium Dog stories The Ragnarok Job/Rage. I began by thinking they were great stories mired by ugly art, but by the time I'd finished reading them I couldn't imagine anyone else drawing the characters or telling that story so well. The ugliness and brutality of Ezquerra's art perfectly serves the nature of most Dredd stories, and you make an interesting point regarding both his background in Westerns/War stories and Wagner's seamless co-opting of so many disparate genres. I'm not really a great reader of sci-fi, and I'm not sure I'd describe much of Dredd as belonging to that genre. Ezquerra's art depicts the character and his world in a no-nonsense manner which brings out the many different genres incorporated into Wagner's writing, reinforcing the flimsy sci-fi underpinnings of MC1 with real weight and solidity. I know, super late, but I love Ezquerra, early McMahon and, believe it or not, Ron Smith, whose work was so 60's sci-fi (he was, in fact, an old guy at the time) that the punkish Dredd looked doubly weird under his pen. I loved "Origins" due to the parallels with America's own, continuing descent into madness - regardless of party. To be honest, for some of us, darker hued and / or poorer citizens, the Judge System has been a reality for some time. There's been talk of retiring Dredd at some point (likely when Mill and Wagner can no longer go on), I'd imagine Fargo's seed of doubt will have some consequences down the road. An aside - I loved the early Judge uniforms - straight outta 60's / 70's sci-fi cinema; part Fahrenheit 451, part Death Race 2000 - all art-house! Does anyone else think that the way Solomon is drawn in certain makes him look a lot like Christopher Lee? Goodman also looks a bit like Jurgen Prochnow from the 1995 movie. This was my instant reaction when seeing the panel when he's introduced. Lastly, was the line "I knew you'd say that" a callback to that infamous 1995 movie? Great read, thanks. So many great Dredd artists listed but I feel compelled to mention Cam Kennedy, who really belongs in the top tier of the old school beside Carlos, Ron Smith, Mcmahon and Bolland.